Used this book for my Distributed Computer Systems module. Mostly theory in distributed systems. I loved reading the book. Many of the terms from this book is currently used in my company. I'm very discouraged by comments that call this book the 'best book' on distributed computing. For one it's incredibly dated. It's like time stopped in 2005. The Java code snippets are unnecessary and do not employ best coding practices. It does have some decent computer history in terms of networking and design, but it's just too difficult to get over how irrelevant some of the information is. I'm looking at the 5th edition (published 2011) and it just comes across as a money grab. It's my own fault, of course. This book has been trundling around my to-read pile for at least ten years. Having finished it, I'm now curious how the state of the art has advanced in the fifteen years since the second edition was published.Case studies work well for me, especially when I can I have an interest in the study object itself, and here the best was a mock-up of a distributed file service. Reading it took longer than expected simply because I kept a notebook handy as was sketching out a design.Other sections don't have such a study, especially for the long slow slog of the middle. About halfway through the book my patience broke and I started skimming.I'm definitely keeping it on hand, in case it becomes useful for something I may have to build someday. 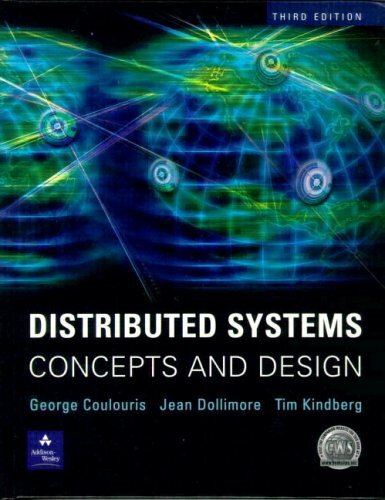 Nice book for who r interested in distributed systems.It's suitable book for studying because it contains [clear examples, clear figures and comprehensive questions @ the end of each chapter].I recommend to read this book. An approachable read, filled with surprisingly relevant case studies. An ideal handbook for the student or professional developer who wants to get their hands dirty with distributed systems. Very good primer on distributed computing and associated problem domains. Good complement to graduate level courses on synchronous and asynchronous distributed systems.